This unit features the same grill face as the Cabinet vent and is also self contained but it is only about 1" in depth. 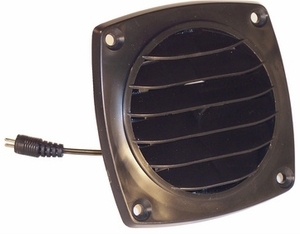 It is an attractive vent that is mounted by drilling a 3 1/8" to 3 1/4" hole in a cabinet and slide it in - connect the power cord to a power supply and you're all set (Power supply included). The fan can also be reversed to either pull air out of a cabinet or draw air into the cabinet. For installation in wood cabinets or enclosures, use a 3 1/8" to 1 1/4" hole saw or for drilling into metal use a good quality 3" hole saw. Dimensions: W - 3 5/8" x L - 3 5/8" x D - 1 1/4"